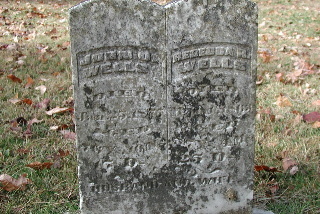 This is a photo submitted by Stephanie Wells Richards of her great-great-great grandparents,' John D. Wells and Rebecca H. (Martin) Wells, tombstone. John D. Wells was born in 1800, in Virginia, and died in Arkansas in 1877. Rebecca H. Martin Wells was born in 1805, in Kentucky, and died in Arkansas in 1863. The Convenience Cemetery is located approximately 14 miles East/Northeast of Batesville, AR, off Route 25.